This is where to find detailed instructions and lots of step-by-step photos to help kumihimo enthusiasts to extend their skills. The instructions use photographic step-by-step photos. If you prefer videos you could try my YouTube channel. Most people start with Round Braid because it is the easiest to learn and master. It is undoubtedly the most versatile of all the braids, but it does have its limitations, so it is well worth learing some other kumihimo patterns, even if they may require a little practise before they become second nature. The effort will be well worthwhile when a whole new range of effects and possibilities is opened up. The design potential is enormous. Round Braid – Quick and easy to learn and it works up very quickly as well. 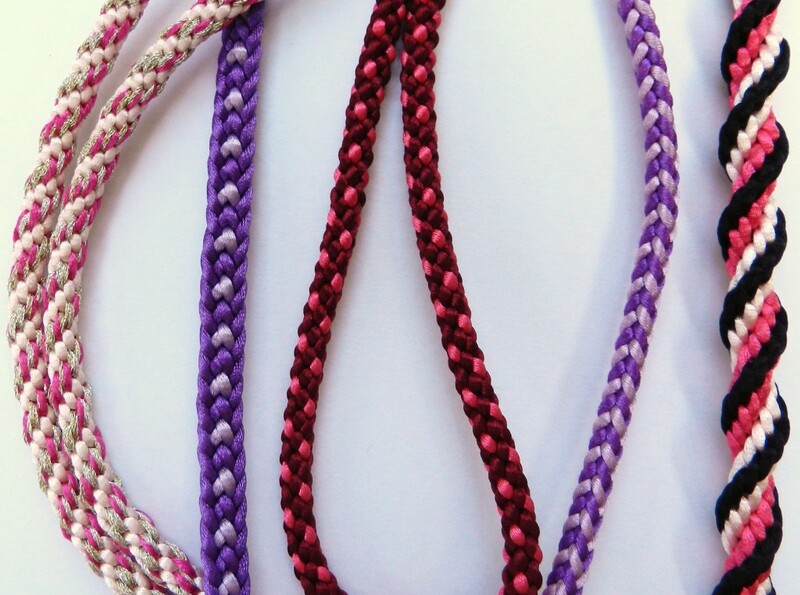 This braid is great for use with beads and works well with all sorts and thicknesses of cord. However, the spiral construction can limit design possiblilites. Half Round Braid – Also known as Half Flat Braid! This braid is flat on one side and curved on the other. It has an interesting chevron design on one side which can be picked out with different colours. It curves well and therefore works very well as a necklace. Hollow Braid – This type of kumihimo is another round style, but the braid does not spiral in the way that a Round Braid does. A hollow core develops in the middle, through which wire or other cords can be threaded. Square Braid – This braid has a distinctly square shape, with a plaited design on each of the 4 sides. The flat surfaces make it an ideal braid to embellish with beads after braiding. Spiral Braid – 12 warps are used to make this kumihimo braid, which has a raised spiral pattern. It works best with colours to highlight the construction. Alternatively the spiral can be emphasised with beads. Box Knot Braid – This is a knotting technique, rather than a Japanese braid, but it is made very effectively on the kumihimo disk. It is most useful as a beaded braid. Don’t forget, the way the numbering works on the kumihimo disk is that the slot is next to the number in an anticlockwise direction, which means that the slot is on the left of the number when the number is viewed the right way up!